Whether an authority established under an Act of Parliament/ State Legislature is a Governmental authority, for claiming exemption under the Mega Exemption Notification No. 25/2012-ST dated June 20, 2012, without having 90% or more equity/control in it by the Government? Shapoorji Paloonji & Company (P) Ltd. (“the Petitioner”) was appointed as contractor for construction of academic complex of Indian Institute of Technology (“IIT”), Bihta (“the Services”) by National Building Construction Corporation Limited (consultant for construction appointed by IIT). The Petitioner initially paid Service tax on the Services but stop paying Service tax after some time and also claimed refund with respect to earlier payments. Petitioner’s contention: Construction/ Works contract of 'educational institution' is exempt under Entry No. 12(c) of the Mega Exemption Notification No. 25/2012-ST dated June 20, 2012 (“the Mega Exemption Notification”), as the Services were provided to IIT, being a 'Governmental authority', which is set up under an Act of Parliament. 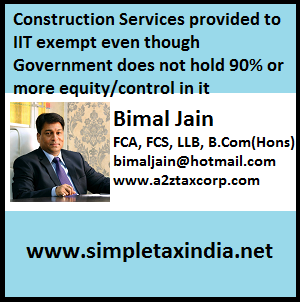 Revenue’s contention: IIT is not a Governmental authority, as Government did not have 90% or more equity/control in it. Hence benefit of the Mega Exemption Notification is not available in this case. "(s) “governmental authority’’ means a board, or an authority or any other body established with 90% or more participation by way of equity or control by Government and set up by an Act of the Parliament or a State Legislature to carry out any function entrusted to a municipality under article 243W of the Constitution;"
is exempt from Service tax in terms of the Mega Exemption Notification as amended. It was further held that since the levy as collection of Service tax paid by the Petitioner or IIT has not been found to be justified, therefore, the Department shall refund the amount of the Service tax deposited either to the Petitioner or IIT, as the case may be, expeditiously. (f) a residential complex predominantly meant for self-use or the use of their employees or other persons specified in the Explanation 1 to Section 65B(44) of the Finance Act. Ø Vide corresponding amendment in the Mega Exemption Notification [New Entry 12A], said exemption is also being restored till 31.03.2020 [Read with Notification No. 9/2016-ST dated March 1, 2016].